The EU has condemned Russia’s “acts of aggression” in the region and called on Moscow to recall its troops from their deployment across Crimea. TAOISEACH ENDA KENNY has described the developing situation in Ukriane as “frightening and dangerous”. His comments follow the EU’s condemnation of Russia’s “acts of aggression” in the region. US Secretary of State John Kerry flies to Kiev today, as the Ukrainian interim government says there are now 16,000 Russian troops deployed across Crimea. Speaking on his way into Government Buildings, the Taoiseach said Tánaiste Eamon Gilmore would this morning brief Cabinet on yesterday’s emergency meeting of EU foreign ministers. Gilmore is due to meet with the Russian Ambassador to Ireland later today to express the country’s condemnation of the military action in Crimea. 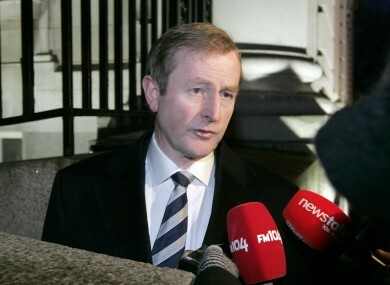 “As you know there’s an emergency meeting called of the European leaders on Thursday,” Kenny said. Speaking after yesterday’s Brussels meeting, Gilmore described the developing situation as “the worst crisis which Europe has faced since the end of the Cold War”. Email “"Frightening and dangerous": Taoiseach hopeful Ukraine crisis can be solved through diplomacy”. Feedback on “"Frightening and dangerous": Taoiseach hopeful Ukraine crisis can be solved through diplomacy”.